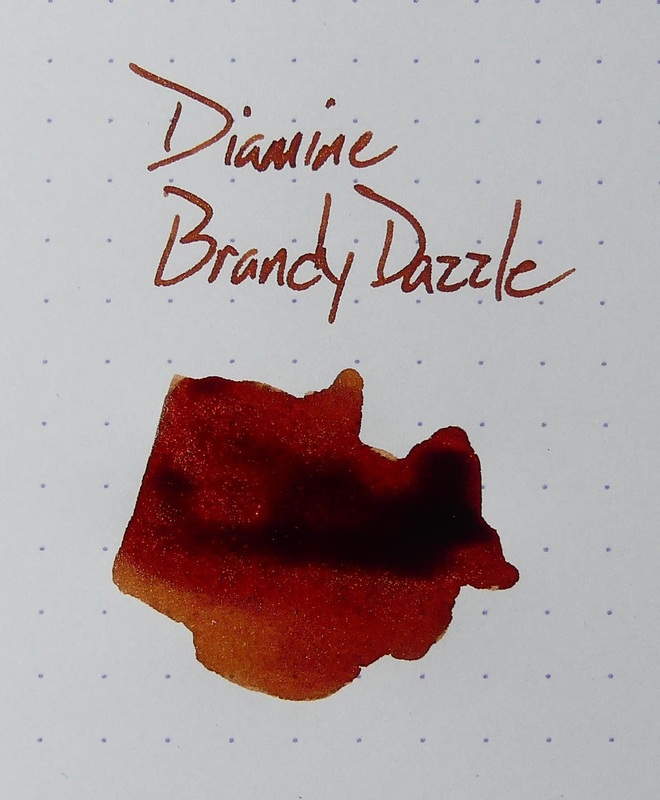 Diamine Brandy Dazzle ~~~ Nibs & Nails! | Inkdependence! This is the first of the shimmertastic inks that I inked up when Anderson Pens sent me the samples for this set, and I think it's my favorite so far. 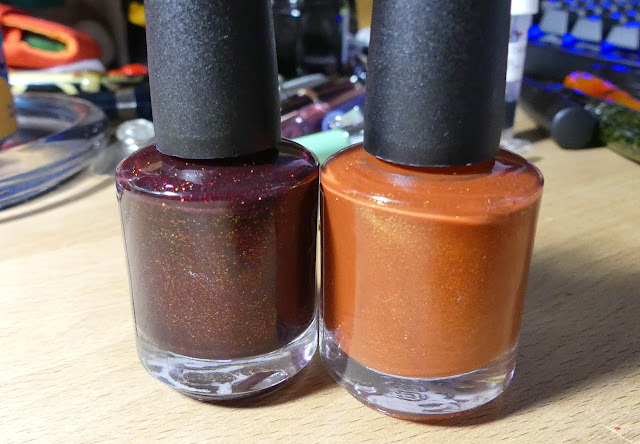 This one is a delicious coppery color with some gold shimmer in it. 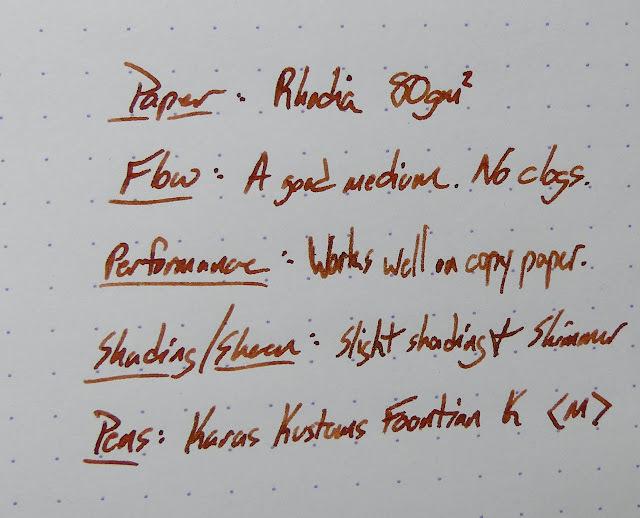 It's currently living in a coppery-orange Karas Kustoms Fountain K with a medium nib, and the ink matches the barrel color almost perfectly. 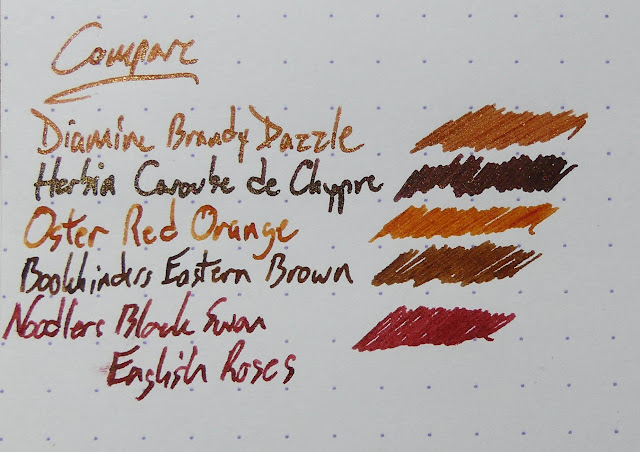 I don't usually like to match inks and pens, but this one kinda begged for it. 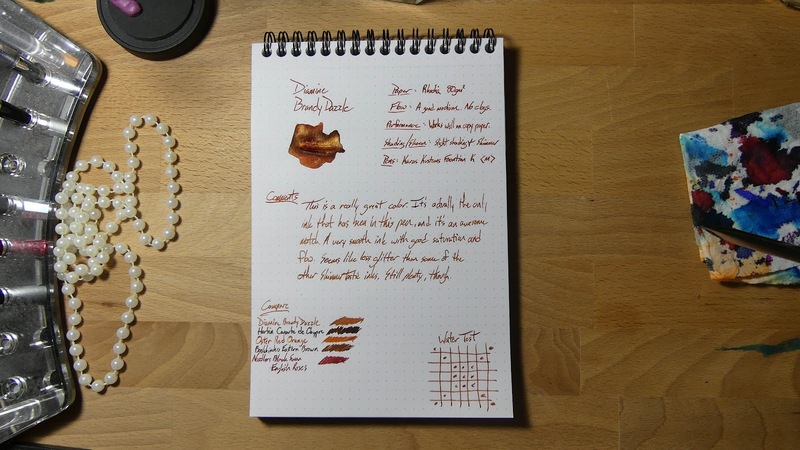 I've been using this ink in this pen for quite a while, and I didn't have any issues with it until I got to the end of this review. When I was writing the copy paper test, it just stopped writing. I got it going again (eventually), but it was really reticent. 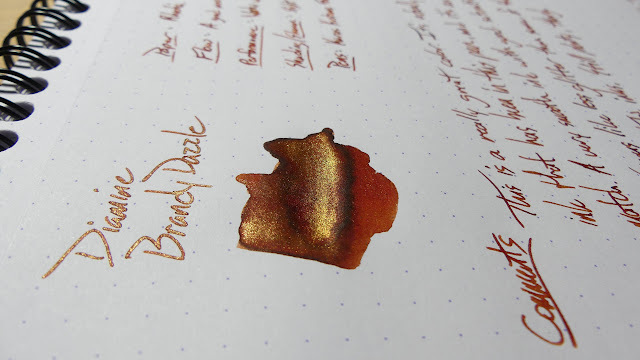 I think I've just been writing short notes with this ink, and the longer writing session involved in putting together this review caused some of the glitter to clog up the feed. So, use this in a wet feed or a dip nib of some kind and you should be fine. 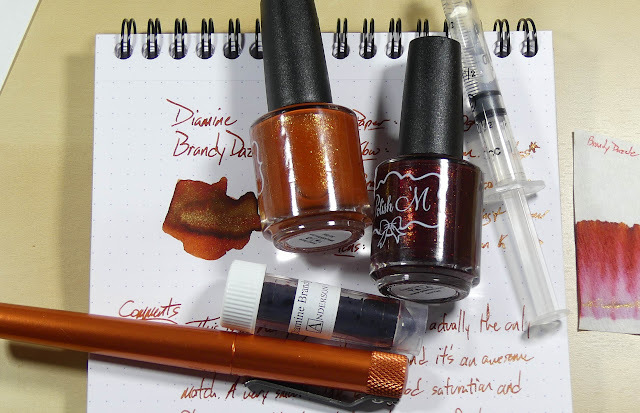 Below, you'll see the two nail polishes that were made to mimic this ink. 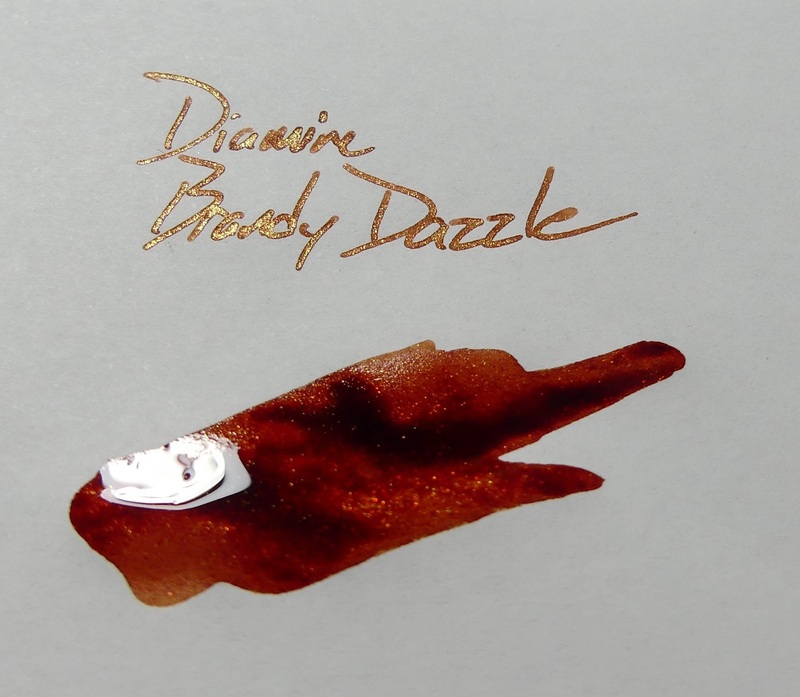 The polish-maker couldn't decide whether to make one that looked like the ink in the sample vial (which is like a dark maroon), or the ink on the page (which is a coppery orange). Of course, the answer is to make both! Head over to RightontheNail to see this stuff in action and enter to win a bottle (for a limited time). 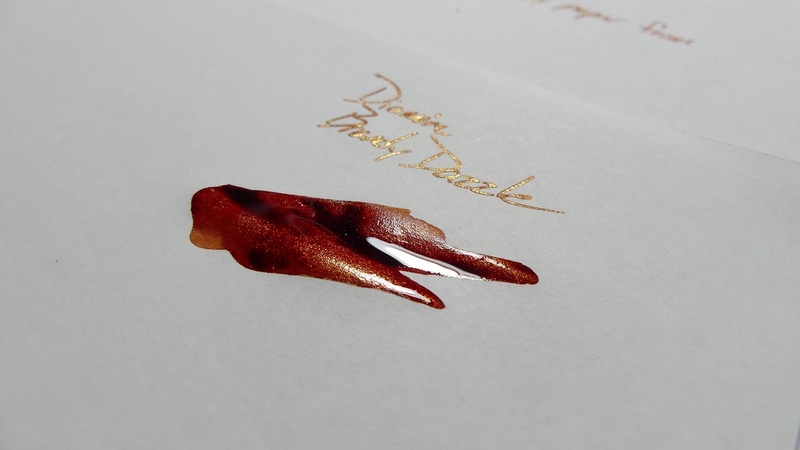 The picture below shows off the shimmer in this ink. 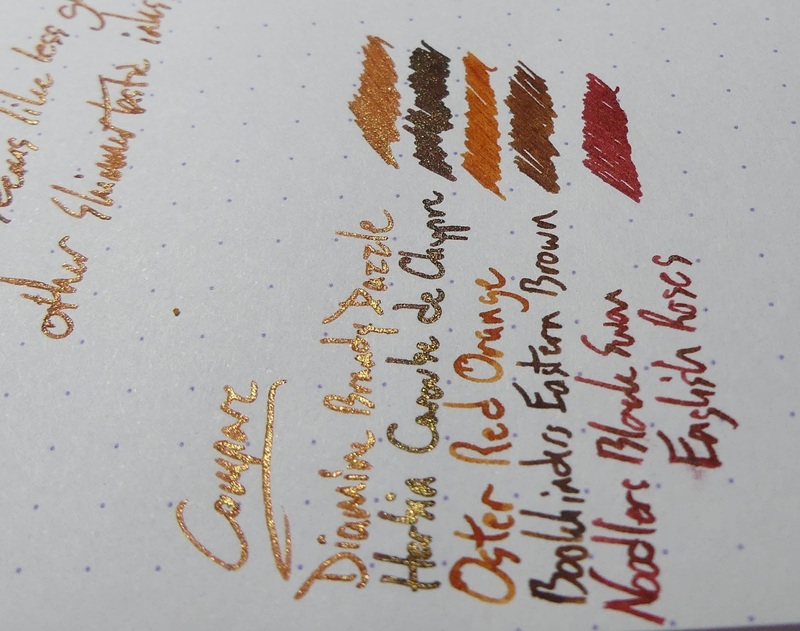 There's plenty, but not quite as much as in some of the other inks, I think. This is a page out of an itty-bitty notebook that Write Pads is going to be producing. It's a great little pad, and the paper is really nice. No bleed through except where the ink pooled the most. Plus, the ink looks rad. See, this is where I had an issue with the pen. 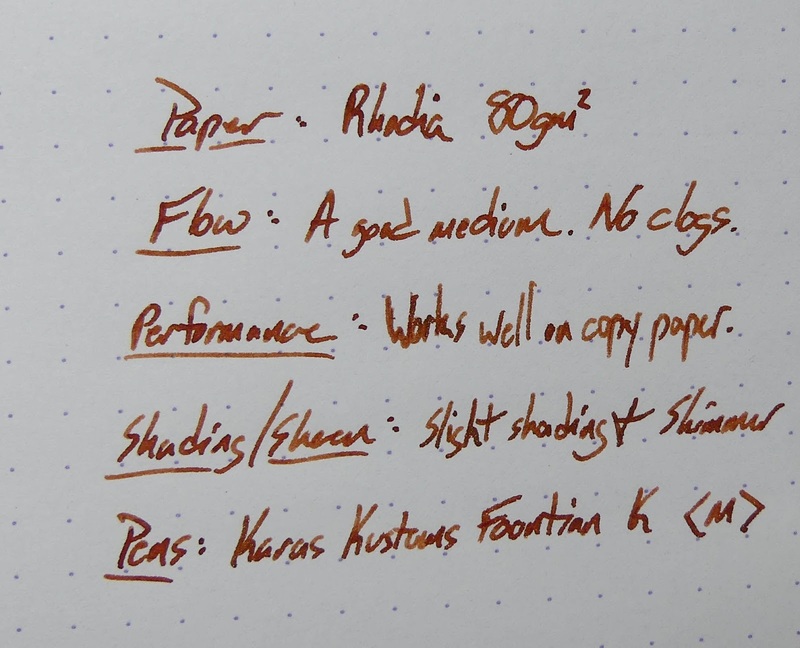 The ink performs well on the copy paper, but it just decided to stop up the feed a bit as I was writing this sample. I think a glitter-dam had formed, and it eventually worked its way out and the pen works again. I just had to prime it a little bit with the converter. These are both wet ink on Tomoe River paper. That's some good stuff. Lots of color in the chromatography. Purples, pinks, orange, red...all sorts of things. Here are a couple of pictures from my desk while I was prepping this review. The first one is from the end of my video, where all of my video-things are piled up. 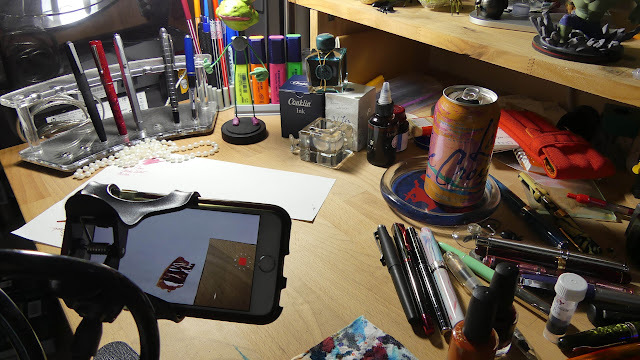 This is a shot of my really messy desk while I was filming the time lapse shot of the ink drying on Tomoe River. You can find this ink at Anderson Pens for $20 in a 50ml bottle or $1.50 in a 3ml vial.